The flow of consumer goods may face shipping delays in the aftermath of Typhoon Mangkhut ,while shipping agencies, airlines and businesses return to normal operations. Two-to-three story high waves surged over the banks of eastern Hong Kong Island, washing away sandbags placed in defense, one local media reported. Surges of almost 4 meters above chart datum were recorded in the Victoria Harbor. 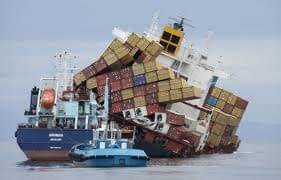 Empty trawlers and barges could be seen floating in clumps, after being blown together out at sea. Almost 900 flights were cancelled in Hong Kong on Sunday due to the typhoon, while bus and ferry services as well as express train service to the airport have been suspended, the Hong Kong government said. Underground trains are running at reduced intervals with stations largely empty. In China, all flights at Guangzhou International Airport were cancelled from midday Sunday through Monday morning. Cathay Pacific Airways said it’s now expecting a gradual return to scheduled flight operations from Monday, but service resumption will likely be very slow, with continued delays and some cancellations. Transit time is one of the most critical factors in logistics as goods must be delivered at their intended destination at the right time. The total time taken from pick up to delivery of goods has a significant impact on the business. Transit times are important for buyers who need to use the product being delivered to satisfy manufacturing or marketing requirements. Shipment delays may affect business through delayed production as the raw materials required for the processes do not arrive in time. Delayed production implies that the business cannot meet the demands of the consumers who may then seek the products from alternative sources. Furthermore, Perishable goods may deteriorate and thus lose value if care is not taken to speed up the delivery process and prevent delays. How Do you Avoid Shipping Delays? Timely deliveries are crucial to the operation of your business, you must always take into consideration the time sensitiveness of your consignment before arranging or selecting the transport mode for your shipments. • proper planning in advance to take into account the expected delivery time while calculating the most probable transit time. • Planning ahead may also mean emergency stocks to enable continuous production in cases of raw material delays. • It is also essential to check and consider the expected weather conditions, holidays in various parts of the world and make a plan based on the evaluated factors. • Necessary documentation is a key to solving any problem caused by delay as the destinations and routes are taken into consideration. • it is advisable to add at least one week to the expected transit time as a provision to any unexpected delays. All our systems are electronically linked to the Australian Customs Service, the Australian Quarantine Service and other government departments. This means we have direct access to duty rates, duty concessions and other information traditionally stored in numerous volumes of paper binders within an instant. This combined with our expert clearance personnel ensures our service is second to none. We always go the extra distance ensuring your cargo is cleared and delivered on time every time. Our customs clearance brokers and freight forwarding agents are experts in all clearance formalities, moving your shipments through customs with easy & efficiency while minimizing potential cargo delivery delays.